The British monarchy's stubborn hold has turned the country into a historical theme park. As the countdown to the Royal Wedding draws to an end, the picturesque English town of Windsor undergoes a drastic transformation. Amid a proliferation of souvenir trinkets with ancient crests and royal faces, armed police are massing, helicopters circle ominously, and the homeless are being removed. As we write, thousands of people across the world are grabbing union jack flags — some of them customized for the royal couple — and boarding trains and planes bound for Windsor. The impending royal wedding is an illustration of something that has been happening for a couple of decades now. Britain’s history or “heritage” has been repackaged and marketed as a kind of brand to be consumed at home and abroad. From the quintessential — yet very much obsolete — red phone booths, to the tourist-friendly marriage of princes, we find ourselves caught up in the cultlike adoration of these quaint landmarks of British national identity. With its empire in ashes, its industrial landscape gutted, and its place in the world thrown into uncertainty by Brexit, Britain is in the midst of a slow-burning existential crisis. Its millions of citizens have been conjured from the earth by distant and long expired historical forces and now wander around urban landscapes that no longer make sense. It is unclear where Britain will go from here. Having long lost its status as the workshop of the world, all that remains is for Britain to capitalize on its history: to become a history factory. Since the 1980s, “heritage” in Britain has grown into a sector of the economy — something like mining or fishing, except that it currently employs more than both these industries combined. It is calculated that history- (or “heritage-”) related tourism has contributed almost £9 billion to the UK economy and supports nearly four hundred thousand jobs. This is nothing new; history has always worked in service of the present. Everywhere, the mythologies of nations or communities form the raw material of ideology. But in Britain, history has recently been given a more specific, macroeconomic role to play — we are witnessing a transformation in what history is for. 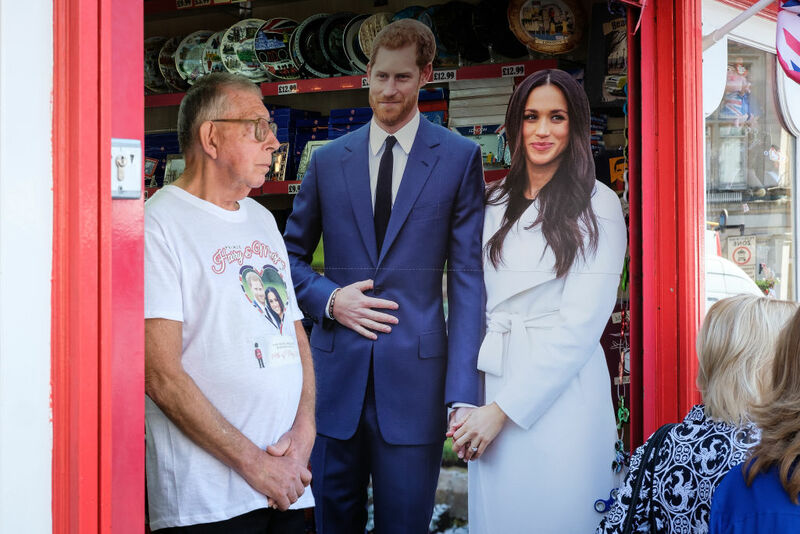 Rising from the ruins of the English Civil War, enriched by slavery, patrolled by drones, and micro-managed by North London PR firms, the monarchy survives in Britain. Indeed, the forthcoming royal wedding has given the institution new life. Likable, American, mixed-race, and divorced, Meghan Markle brings a vague ambience of alterity to the table. As if the official ruling family of the commonwealth itself could somehow be decolonized, or as if a system of sovereignty based on blood alone could made multicultural. Nevertheless, Britain has put its ancien regime to work. One of the most common arguments made in defense of the monarchy is that it is good value for money. The cost-benefit analysis of lingering feudalism is surprisingly exact. The queen’s treasurer has calculated that it costs just sixty-five pence (roughly one dollar) per British citizen to sustain the royal family. Meanwhile, the argument goes, the concentration of vast amounts of state wealth and power in the hands of one family is good for tourism. Unelected rule is, at least, mercifully cost-effective. Like a red phone booth, useless but with a fresh lick of paint, the royal family keeps putting on a show for those beguiled enough by charismatic forms of premodern power to travel to Britain to see it — bringing £550 million a year with them. Perhaps because of Markle’s citizenship, this wedding seems to have struck a powerful chord in the United States. In Washington DC, a pop-up bar themed after Windsor Castle is serving “God Save the Queen” martinis with edible crowns. In New York, the Downton Abbey Exhibition, a Manhattan-based museum with memorabilia from the show, is hosting a 200-dollar-per-head viewing party complete with a full “upstairs, downstairs” butler service. One jeweler’s website crashed under the weight of Americans trying to order a replica of the couple’s engagement ring. All across one of the largest and oldest republics in the world, there are millions willing to suspend their disbelief. The trans-Atlantic nature of the royal match threatens to provide the family with a captive audience of hundreds of millions of Americans who will bankroll and eagerly consume their antics. (America has, after all, an impressive track record of propping up unelected governments overseas.) The British history factory has offered an alluring new image of its monarchy as something progressive and inclusive. Prince Harry, who dressed up in Nazi uniform for a “Colonial and Native” themed costume party, and who was recorded racially abusing fellow soldiers during his stay in the army, has been resurrected as a symbol of a more sensitive, less patriarchal royal family. As for us, British anti-royalists, we can’t help but feel annoyed. This is, after all, our tragedy. Our unelected ruling family, with its racist jokes, massive state subsidies, and copious soft power, is not a just a trendy fad. Life inside Britain’s history factory is increasingly confusing. In many parts of Britain, the look and feel of city streets has been transformed. For instance, York, the medieval tourist town in the north of England where I live, is particularly disorientating. Take a brief walk through town after dusk and see the tour guide, dressed as Guy Fawkes, smoking a cigarette while waiting for his wards to emerge from a nearby pub, his face lightly illuminated by an iPhone. See Ubers jostle for space on narrow roads with horse drawn stagecoaches and drunk leering Scandinavians dressed as Vikings. Wait for the tourists to recede to see ancient and modern forms of poverty and wealth simultaneously on display, as gathering ranks of homeless people come to sleep under the arches of York’s medieval cathedral. This history factory’s greatest product is probably television. Downton Abbey, a mawkish valorization of a fading aristocratic family written by a Conservative member of the House of Lords was an enormous hit, whose finale was watched live by ten million Americans. This has been followed by a slew of programs set between the sixteenth and the mid-twentieth centuries – including Poldark, Call The Midwife, Mr. Selfridge, The Tudors, and Peaky Blinders. Perhaps the most pernicious of these shows is The Crown. Like so many recent high-budget box-set TV dramas The Crown is about someone learning how to be good at their job. It is a celebration of expertise and tacit knowledge on the part of the young queen. As a woman surrounded by men, she learns to find her voice, commanding authority over her henchmen, over her peevish husband, and over a satisfyingly drooling and corpulent Winston Churchill. In the same way that Mad Men shows Don Draper being good at advertising or House shows Gregory House being good at medicine, The Crown shows Elizabeth Windsor being excellent at ruling. Unfortunately, this show rarely pauses to reflect on what this job meant and continues to mean. In a telling moment in the first scene we see Elizabeth’s dying father passing on to her some words of wisdom about how to manage affairs of state. In later scenes, the audience is compelled to root for the queen as she rebukes a succession of dim-witted Tory prime ministers. In these scenes, we are to sympathize with an aristocratic and unelected head of state — one that is still in power in Britain — attempting to override democratically elected representatives. The history factory risks circumscribing political debate. The monarchy’s future is an open political question — or at least it should be. This is something sidelined by the history factory’s utilitarian logic. Under these circumstances it gets more difficult to entertain the urgent question of constitutional reform. The monarchy, as well as Britain’s hollering House of Commons and geriatric House of Lords have become untouchable parts Britain’s “brand” or heritage. In a notorious poll, 59 percent of the population said the British Empire was “more something to be proud of than ashamed of.” Britain’s imperial history has been openly celebrated by both Conservative and Labour MPs. Strangely, Britain’s nostalgia complex has emerged at the same time as some of the most intense public debates about the meaning and legacy of the British Empire. To the dismay of right-wing journalists, students, activists, and professional historians such as Catherine Hall have fought to decolonize curricula, banish statutes of high-profile imperialists, and demonstrate how Britain’s nineteenth-century industrial supremacy was existentially dependent on its eighteenth-century history of slavery and wealth extraction. Just as accountants have run the books on the royal family and found that an unelected cadre makes sound fiscal sense, so some recent historians have tried to do a cost benefit analysis in defence of Britain’s Empire. According to historians such as Oxford’s Nigel Biggar and journalists such as the Evening Standard’s Tim Cooper, the results are mixed. Property rights, hospitals, roads, and financial institutions must be weighed against slavery, mass famine, and the almost wholesale extermination of the native populations of the Americas and Australia, as if, even in the crudest, most ahistorical calculation, the former could somehow atone for the latter. In the classroom, it gets harder and harder to clear away the cobwebs of fantasy and nostalgia. For many students in America, British history is a kind of escapism. Students arrive wanting to hear about the emotional lives of aristocrats. For many, violence is not the Amritsar massacre in India but Jack the Ripper, the industrial revolution is not Manchester but the Hogwarts Express, and empire is not slavery but Claire Foy portraying the queen on TV, gazing rapturously at bathing Kenyan hippos surrounded by white advisers. Amid the frantic attempts to represent Britain’s past as cobbled and quaint it gets harder each day to meaningfully connect the past and the present. This task requires the acknowledgement that the past is a process, whose structures, institutions and power relations still weigh heavily on the politics of the present. Instead, Britain’s history factory delivers the past as a finished object, something to be charmed by and nostalgic for. Laura Gutiérrez is currently completing a PhD in criminology in the University of Cambridge.